When I walked into the Guthrie's Dowling Studio theater last night to see* The Edge of Our Bodies, the star of the show, Ali Rose Dachis, was quietly sitting on stage, barely moving, just observing. It was a bit disconcerting at first (Am I late? Can we talk? ), but eventually the audience got used to it and the usual pre-show chatter ensued. At showtime the house lights slowly went down, the audience became silent, and Ali began talking. And she didn't stop for 90 minutes. We soon found out that Bernadette is a 16-year-old student at a boarding school in Vermont. She begins by reading from her journal, barely looking up as she recounts her journey by train into New York City to visit her boyfriend. She eventually puts down her journal and paces around the stage, acting out some of the story. The purpose of her trip is to tell her boyfriend that she's pregnant, but of course things don't go quite as she planned. Bernie has a series of encounters on her journey - an old man on the train, her boyfriend's sick father, a man she meets in a bar. Each encounter is beautifully told in a way that makes it seem like you're watching the interaction as it happens, instead of listening to Bernie tell about it sometime later. She's somewhat of a pathological liar; she makes up a different back-story for herself with everyone she meets. She returns home after an unsatisfying visit to continue on with her life as best she can. What an amazing feat of acting, not just to memorize what is basically a 90-minute monologue (except for one brief interruption, which is a bit jarring but helps establish the setting of the play), but also to create this character and tell the entire story by yourself with no help from other cast-members. No breaks or pauses, just continuous story-telling. Ali does an amazing job of bringing Bernie (and the other characters as seen through her eyes) to life through her storytelling. She was hand-picked by the director, Benjamin McGovern, after directing her last year in Circle Mirror Transformation (one of my favorite shows of 2010). In that show she played a sullen teenager, but this role has much more depth, which she's definitely up for. Of course it probably helps that the material is so rich. The Edge of Our Bodies is a beautifully written play that sounds like it could be a short story (there's lots of "he says," "I reply"); Bernie wants to write short stories when she grows up, making one think this could be her first short story. I came away from the show wanting to read some of playwright Adam Rapp's novels or see more of his plays; I really connected to his writing style and the flow of his words. Even though his name sounded familiar, it wasn't until I googled him that I found out he's Anthony Rapp's brother (he originated my favorite character Mark in my favorite musical RENT, and I had the pleasure of seeing him perform the role on tour a few years ago). Talented family. It took a little while to figure out what the set was supposed to be, where is Bernie telling this story from? The floor of the stage is a series of marble circles, and the furniture is ornate and old-fashioned looking, in contrast to the young and modern story Bernie is telling (Michael Hoover designed the set, and also designed the realistic lived-in house of Park Square Theatre's August: Osage County). We learn that her school is doing the play The Maids by Jean Genet (about two maids who play at killing their employer), and it becomes apparent (especially after the janitor interrupts her and starts dismantling the set) that she's on the abandoned stage after the run of the show. She interjects overly dramatic scenes from the play into her storytelling. 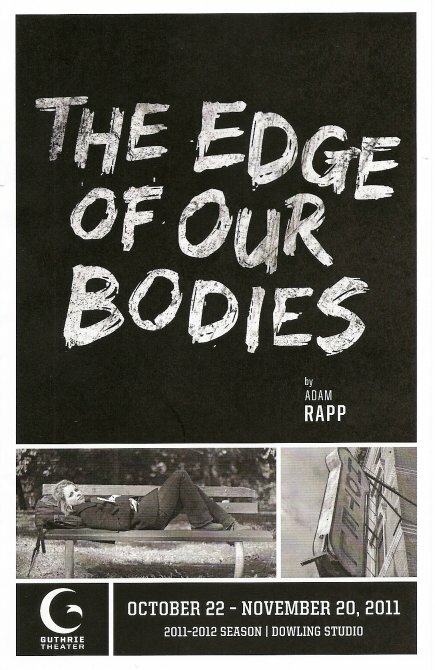 The Edge of Our Bodies is a beautifully written play, beautifully acted; a great 90 minutes of story-telling. The other two shows playing at the Guthrie right now are big and loud (Burial at Thebes and Much Ado About Nothing); this play is a nice contrast to that. One person telling a story from the heart can be just as effective, even moreso, than a large cast. That's what I like about theater; it can be wild and crazy, or silly and funny, or quiet and poignant, or anything in between. *I received two free tickets to this play as part of "Blogger Night at the Guthrie." I seem to run into Peter Rothstein (Artistic Director of Theater Latte Da) everywhere I go lately, but I swear I'm not stalking him! ;) I spotted him in the 4th floor lobby at the Guthrie. I didn't see him up at the Studio so I'm not sure what show he was there to see. I like to think he saw Burial at Thebes because they do some pretty innovative story-telling through music, which is what Latte Da is all about. Great review! I was part of the blogger group too and so loved this play. Intense! Just found you on the Guthrie Facebook page...looking forward to following you.